So, I realized yesterday that I’m going to be in Kansas City a grand total of five days this next month. Five!! Between a girls’ weekend at the lake, some fun work trips to Pittsburgh and Minneapolis and New York, plus my first long road trip with this cute guy to chillax at a cabin in North Carolina, somehow the calendar filled completely up. Which makes me completely excited (so many adventures ahead!). And profoundly grateful (still can’t believe that I have my dream job that allows me to travel!). And — I’ll admit — a little anxious (mostly because I have to do double the work before I leave, since no one’s there to cover for me in my job while I’m away). Needless to say, there’s a mega to-do list sitting beside my computer that’s staring back at me all day long. And my natural little “achiever’s” inclination is just to put my head down and power through. But hey, these precious days at home are also the precious five days that I have to spend with the people I love here in Kansas City. And as satisfying as it would be to stay in and cross more items off of the to-do list, I know from experience that happy hours and coffee dates and neighbor nights make for a much more satisfying and memorable days. Of course, I prefer days with a good mix of both working hard and friend-ing hard. But thankfully I have some good friends around to make sure that the latter is the priority. With a full day of meetings on the calendar, I knew that there was already going to be far more work to accomplish than I had hours in the workday, and I considered clearing my schedule for the evening. 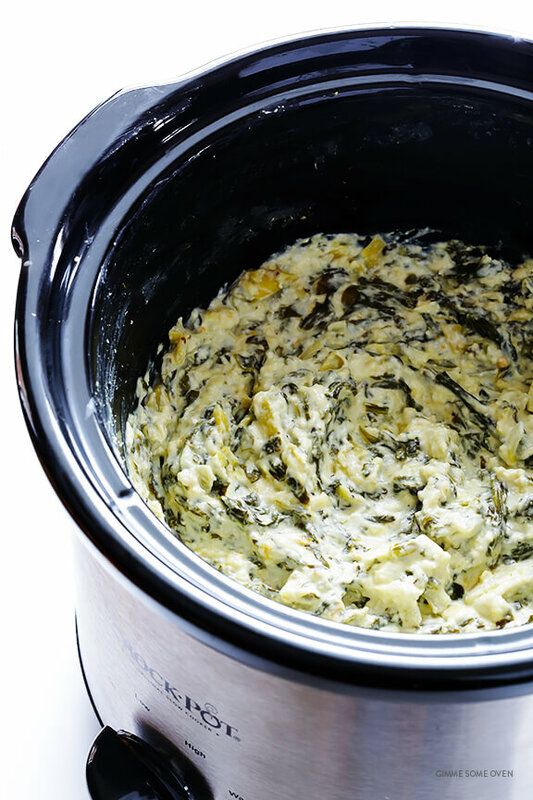 But mid-afternoon, I decided to throw the ingredients for my favorite spinach and artichoke dip into the slow cooker for the evening — partly because there’s nothing I love more than a good spin dip, and partly so I’d have it waiting as a reminder not to get in workaholic mode and back out on my plans with friends. 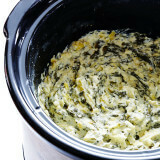 Sure enough, come 5pm, the dip was bubbling and delicious and begging to be enjoyed. So I closed up my computer and hit the road. And hours later — after a lovely happy hour shared at the home of a dear friend, followed by a raucous stop by our weekly neighbor night back at my loft — I’m so glad I did. 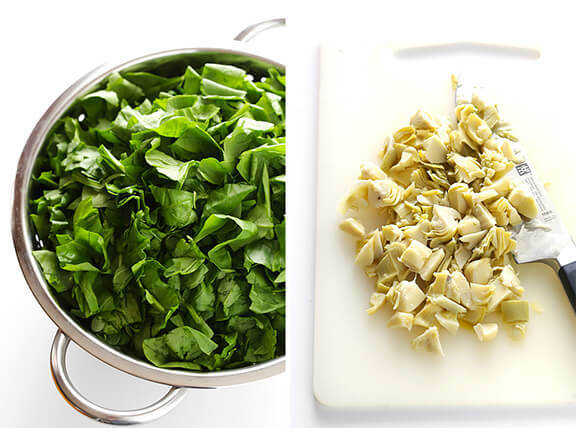 Good food shared with good friends always wins. 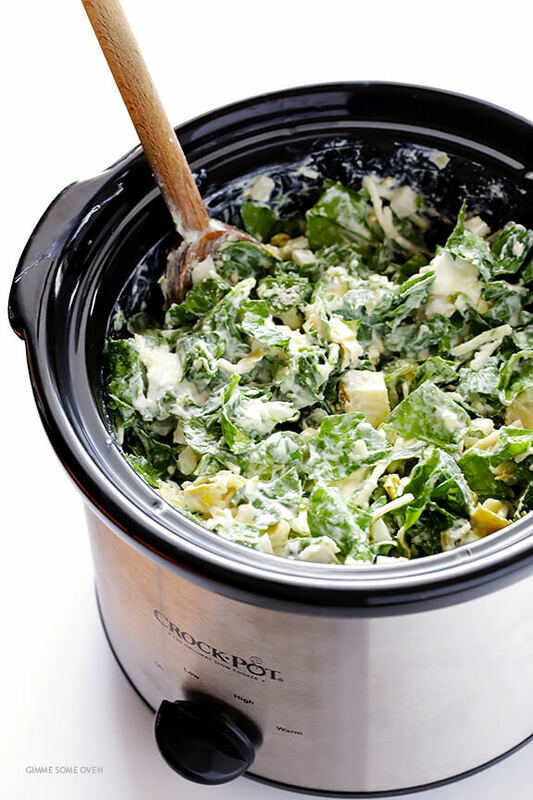 Seriously, I’ve been making spinach and artichoke dip in the oven and on the stovetop for years and years and years. And I don’t care if it’s becoming a dip of the past, and other appetizers are more trendy. I love me some spin dip! So I did! 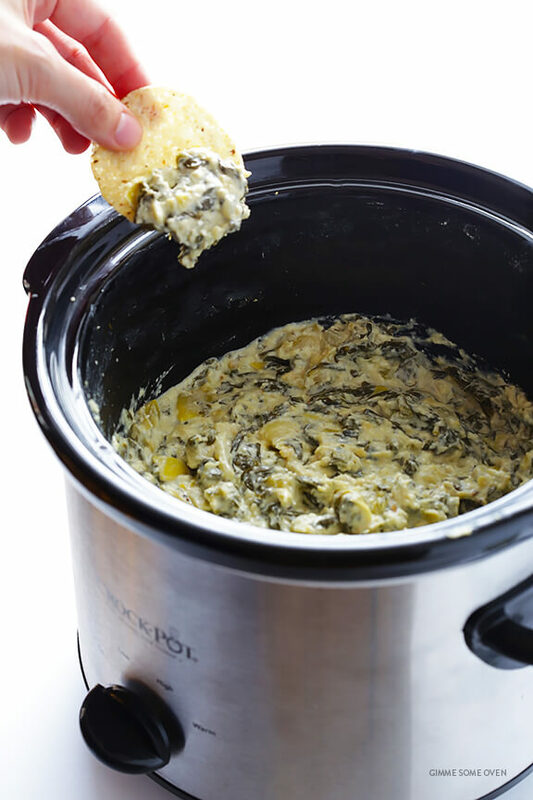 But for something different during my crazy day full of meetings, I decided to try an experiment and toss all of the ingredients from my favorite spinach and artichoke dip recipe in the slow cooker (instead of baking them in the oven) to see what happened. And then stirred ’em together. And sure enough, 2 hours later (or 3-4 hours, if you want to cook this on “low”), I couldn’t wait to get out of the house and take this dip to share with my friends. 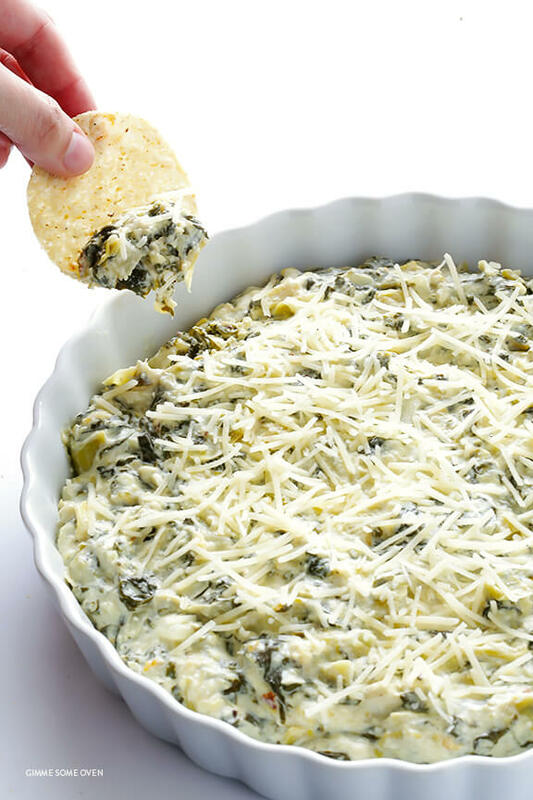 So if you’re looking for an ultra-easy appetizer for busy nights, or game day, or whatever fun adventures you have planned this fall, I can’t recommend this one enough. It’s a classic. 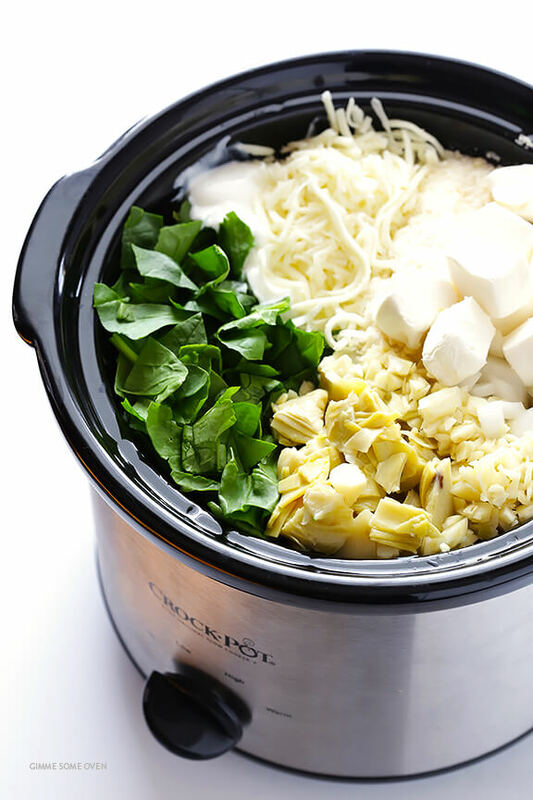 And at least in my house, it’s going to be a slow cooker classic from now on.